How’s business in the Keene area? NH Business Review recently met at the Southwest Region Planning Commission’s offices in Keene with businesspeople to get their take on the issues facing the area. Victor Kissell, senior manufacturing supervisor, Tidland Corp.
Q: The impression you get from visiting the Monadnock Region, and particularly Keene, is that things seem to be working. Why do you think that is? Susan Bloom Newcomer: I think one of the reasons it works here is because we’ve been thinking for a really long time about what we need to do. We need to solve our own problems, so we have a strong sense of collaboration among all the partners, whether it’s the business partners, the nonprofit partners or the public sector, we rely on one another to get stuff done and we do it. Kendall Lane: This community is incredibly self-reliant. We’re unique in the state of New Hampshire. We don’t have any other large urban center within 50 miles of any direction of the city of Keene. All the other urban city centers in the state have other urban centers close by. So, if we don’t take care of ourselves, it’s not going to happen. We’ve got over $100 million in new construction taking place right now. The community, quite frankly, is thriving. So if you look at the economy in Keene, it’s thriving, it’s doing very, very well, but we’re facing a lot of challenges to keep it going. Mary Ann Kristiansen: I think the community has fought really, really hard to keep our core, our downtown, beautiful and vibrant with a number of initiatives to make sure that downtown is beautiful and is active and vibrant. We have never really seen a decline like a lot of downtowns have, [and that] has helped bolster all these other things, too. Lane: When there are issues in this community, groups come together to solve those issues. Sometimes they are official groups from the city, but frequently they are not. Mary Ann and the agency that she works with are working very hard on the downtown. I’ve set up a revitalization committee to work on the downtown. I know there are two or three other groups out there that are also working on aspects of the downtown. It’s incredible the way people collaborate within this community and come together to solve issues that they see going on. Victor Kissell: I think I have to applaud the efforts of the Keene Chamber. Susan (Newcomer) and I started workforce development in 2007-2008. The chamber has done well with pulling different entities together to bring the issues together as a group and solving that problem as a group so we can attack it and address it as we need to. We’ve got Keene State College on board, River Valley Community College, the high school is playing a key part in all of this – they’re training students who have the ability to get a real job when they come out of any class in that department. They’re work-ready when they come out. It’s not just manufacturing — it’s all the different curriculums that they have in that facility. John Sansone: When I think about some of the success of Keene, it’s about the balance, because when I worked at Peerless, bringing in executives and managers from other parts of the country, we were always able to talk about Keene and really attracted people from the perspective of raising their families. It’s not too big, it’s not too small, it has all the services, whether it’s church, education, jobs, so I think that’s part of why it’s so stable. Liz LaRose: From a United Way standpoint, we’re an organization that helps to focus on addressing social needs, and there are significant social needs in our community in relation to children, education and financial stability. What we see here is that our individuals who live here, our businesses and all the nonprofits really work so well together to raise the funds to get to those needs. This community comes together to answer those needs, not only with addressing social needs, but also with our economic stability and the chances for keeping a workforce here. Because if you have a great place to live, and you have a wonderful place where people are taken care of, you want your family to be here. It feels good. You have a beautiful downtown. You have a place that people can go to and work and feel confident. We’ve got a housing project going on right now on Washington Street, building 120 units of one- and two-bedroom apartments and they’re marketing it specifically for Millennials. It’s really designed to encourage young people to stay in the community. Chris Schon: I would echo a lot of what I’m hearing in terms of strong community partnerships, and I think even more so than seeing other communities, to some degree, in other parts of the state. I know Cheshire (Medical Center) has a strong history trying to work with the community to improve health overall, but, thinking of employment, working with the colleges because we have a significant need for healthcare workers. Overall, we try to figure out what’s best for the community, even from a healthcare perspective: What services can be bring into the community to allow individuals that live either in Keene or the surrounding Monadnock Region to access higher levels of care without having to travel out? Because we also know transportation, especially for the elderly, becomes very problematic over time. Philip Rentz: I agree – there’s a real sense of community here. But also it’s a broad-based economy. There’s no concentration on one single industry, so if one industry is down a little bit, there’s another industry picking up the slack, and I think that’s important too. Like Kendall said, there’s nothing nearby; it’s an economic oasis here. You don’t have other towns nearby, so this is a center for a lot of small communities to come in and to do their shopping or their healthcare or whatever activity. Q: How is the community addressing workforce challenges? Lane: We do have a problem keeping young people here, and we’re working really hard to try to make the community more desirable for them. We’ve got a housing project going on right now on Washington Street, building 120 units of one- and two-bedroom apartments and they’re marketing it specifically for Millennials. It’s really designed to encourage young people to stay in the community. 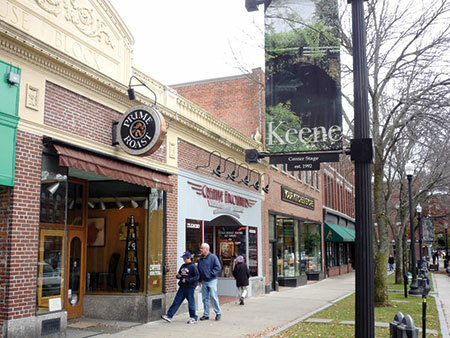 But in Keene, 30 percent of the workforce is eligible for retirement. The loss of expertise, the loss of experience that we’re going to suffer as people retire, is something that every employer in the city is going to be suffering. It’s going to be very difficult to replace that. I know that a lot of employers right now are saying people who have retired are coming back on a part-time basis to try to fill the positions and try to provide the expertise that isn’t otherwise available. Schon: If you think about it with health care workers, in particular nursing, it’s not just here in Keene but it’s nationally that a significant portion of registered nurses are in the 50-plus range, so we have a big out-migration and they tend not to hang on as long because nursing is hard work. We work closely with Keene State College, Rivier and other programs. We’ve just hired 26 new graduate RNs and BSNs who are put through orientation and training, and we hope we can retain them all, but many of them often get the training because the training’s excellent and then they want to move to a bigger city, more competitive wages. We’re spending a lot of time thinking about how we grow our workforce, including doing apprenticeship programs for certain very-hard-to-fill positions around medical assistants, pharmacy technicians and the like. Daniel Henderson: I do see the other side of the coin that’s being talked about right now – the opportunity for students that are graduating from college or in the pipeline to graduate. A lot of the companies that we work with here acknowledge that they have this challenge and the difficulty recruiting people from outside, and they see that college is a resource to home-grow talent. That’s something that we’re really focused on with them. If we can get interns there to get to know these businesses and they can get to know the interns, the chances of them converting that to a full-time hire, reduces their hiring risk. That’s what I see as the opportunity. We’re not there, I would say, in terms of our ability to fully deliver on that, but we’re certainly developing the relationships and creating a set of opportunities. Newcomer: I think that 22-year-olds and 23-year-olds don’t tend to be attracted to a small town area unless they happen to have an outdoor profile, unless there’s someone who really wants to hike and do all the things we can do outdoors. I think we have a better shot at recruiting when they’re young families because, as John (Sansone) pointed out, we have the value system and the ambience too, and the education system all where a young family can thrive. So if we can somehow add that level of recruitment to our region, I think we’ll fare better. Another interesting program happening in several companies — what they’ll do is pair you up with a few colleagues in your office so you can have your baby with you, but if you need to leave, you need a little bit of time, those couple of people are your support folks in making sure that child is there. ​LaRose: There are some innovative things happening in the community to keep young families here and engaged in the workplace. The Impact Monadnock Business Ambassadors Group, a group of business owners, large and small, is working on child- and family-friendly policies and helping businesses across this region to enact those in their organizations. Some interesting things that are happening in the region are babysit work programs, where in different companies of different sizes you can have support at your office to bring that child in for, say, the first six to nine months. There’s also your typical nursing moms type of a thing, and there are also child-reimbursements and subsidies that individuals are doing and they look at paid leave different. Henderson: I know there a lot of students that want to go and get away as soon as they possibly can, but I think there’s a lot of students who aren’t necessarily knowledgeable about what sort of opportunities exist in the region and in the state. One of the things I do at the college is run a speaker series where I bring businesses in from around the region and around the state to come talk about what they do. It’s all from the president or CEO of the company or senior engineers, sometimes it’s people from human resources, but they come and talk about their companies. They come and talk about what skills they’re looking for. One of the companies we work really closely with is a biotech company up in Lebanon called Adimab. The first Keene alum they hired — the first now of six that they’ve hired — was working at Bagel Works in Keene. He was a chemistry major, didn’t really know what he wanted to do and he was lucky enough to have a family contact that knew somebody there. He had no idea companies like this existed in New Hampshire. He’s been very successful there — he’s been promoted multiple times — and has paved the way for other students to come there, and that relationship has helped us extend our relationships with other biotechs up in Lebanon. Q: Mary Ann, do you see the same demographics true in terms of the people who come to the Hannah Grimes incubator? Are they also skewing older or are there younger people as well? Kristiansen: As with most incubators, everyone thinks entrepreneurs are young, but they’re usually post-career, so I think our average age is 54. We do have younger folks though. At our events and stuff like that, we are attracting younger people, which is really good. I think Machina Arts, which is a business in town, is starting to truly have an impact on the culture of the town and kind of do an arts-forward, cool vibe as they’re getting involved in different events and different things. It’s interesting how single-handedly a company can have a force on that. They’ve been working with the (Keene) Sentinel, they worked with us, they worked with some other groups to design events. I think our events have gotten edgier and more fun, and I think more people are attending and more young people are attending. Q: Is the availability of housing preventing people from either taking a job with your company or even staying? Newcomer: We did not have much apartment development for a really long time, but, in the last two years or so, we’re beginning to see this. I also want to give a little bit of credit to Keene State College because the pressure on the Keene market was very high because the requirement to live on-campus was for only one or two years, so a lot of those students were living in the apartments around town. There’s been a lot of private development around the college, which has taken some of that pressure off the market. I don’t know that it’s helped rents that much, but it’s taken the pressure off so that the availability is a little bit better. And I also want to make a comment – we are not just Keene. We have a significant number of towns outside Keene that house at least 40 percent of our population. The problem is that the Millennials never want to live in Chesterfield or in Marlborough or Marlow. They want to be in the city. It’s kind of a balance here. Kristiansen: I have a Millennial working for me, and he had a hard time finding housing. I think he’s bounced around a couple places during his tenure here. I think that’s going to change. I think between what’s happening at the Colony Mill now and what’s happening in the middle school, we are going to have, what, 150 or more units. So, I just think that’s going to change. LaRose: We have staff who are Millennials, and they have expressed a lot of dissatisfaction with how high the rents are and wanting to be right here in Keene and not having to commute from the outside. And it’s been prohibitive to really afford to live right in central Keene. That’s an issue. Lane: The regional planning commission a few years ago analyzed how much it cost to own a property in Keene as opposed to the towns around Keene. Quite frankly, that housing, in a lot of ways, is more expensive, if you take the cost of the housing, utilities, mortgage and transportation. Keene is the cheapest area in the region to actually live right now, and as we go forward, that the desirability of Keene as a place to live is going to be much greater than it has been in the past. Q: Is transportation infrastructure a concern for businesses locating here? Newcomer: It’s a multi-level problem. It’s not just the individual that has to drive into town, because most of the jobs are in Keene, but it’s also transportation by way of trucking for various businesses. Rail is impossible because there is no way they can use that. There’s not a usable airport — it’s a private airport, but it’s community-owned, but it doesn’t have regular flights coming in there, so transportation is an issue. Lane: The airport is one of the biggest assets that we have with the businesses that are located here. Every day, business executives are flying in and out of Keene. One of the things that’s changed over the years, most of our businesses are not locally owned; most are owned by national or international companies. They transport their executives in here; they fly them into the airport, they do the business they have to do and then they fly them out. Kissell: Eighty percent of the people working for our company here in Keene live outside of Keene. It’s like Susan said, they’re in the local surrounding towns. As far as industrial transportation, we’ve got a lot of product coming out of Boston, so they’re either coming up Interstate 91 to 12, so this whole area is kind of isolated from the main corridor of transportation, north and south or east and west. That’s one of the things I constantly get asked from our CEO when he comes out to this area. He says, “Why did they choose Keene?” I tell him, “Because of the rural area that we are in.” I have to say, the work ethic and the community effort that we have here is unsurpassed in most of America. The Keene division within our the worldwide organization is the best in the world, out of 1800 facilities in the world. It’s all because of our collaboration work ethic that everybody has in this area. The airport is one of the biggest assets that we have with the businesses that are located here. Every day, business executives are flying in and out of Keene. Schon: For our patients, transportation can be a problem. Especially as you start to get in the more elderly patient population. So if you think of people you’re serving at certain businesses like ours, you have to start thinking about how you get them to services or, more important, how do you take services out to them? There’s a lot of thinking in health care these days that people don’t necessarily have to come into the clinic or the hospital to get services. If you can meet a patient or individuals with certain chronic diseases like diabetes, and you send health workers into the home to make sure that they’re following their medication, that the food choices are right, and take care of a lot of these social needs, you can keep them healthy without the expense of transporting them and/or the expense of a doctor visit. LaRose: A lot of the nonprofits are doing the same thing — home visits and really figuring out how to bring people in groups somewhere that’s local, where they can come into a center, or going right into the homes to deliver those services. Henderson: I was over at Markem Imaje yesterday — my former employer — and they are using technology everyday to address their collaboration across their different geographies. They have a room set up with cameras at odd angles and a Skype interface, and they do their daily 15-minute meetings with their counterparts in England and other locations. From that perspective, it doesn’t matter where they are. Lane: As we talk about making the community more attractive for Millennials, we also have to make the community more attractive and diverse. Until we make this a community that is welcoming to a more diverse population, it’s going to be very difficult for us to get a large number of people to move here, to want to live here and to be comfortable here. That’s really a critical thing that the community has to work on. It has to pay attention to the future. Schon: We’re also seeing an increase of physicians who maybe have medical training from India or the Middle East and then come to this country to do their residencies and fellowships, and then seek employment. So you do see a changing face, in particular, in health care. We’re not as rural, but in very rural areas, that’s going to be the preponderance of individuals who provide health care. Our challenge is, with the environment now around visas being much more strict, it’s going to make it much more difficult, not only for us, but for others who want to recruit skilled workers or skilled individuals who need to have visas or the like to come into the community and stay. We’re balancing that right now, but we’re seeing a changing face, and health care tends to get much more diverse over time. Q: When people from other countries settle here, do they stay or do they feel isolated? Schon: I don’t think there’s a rule of thumb on that. We’ve had some long-term individuals who have come and stayed. If individuals are leaving, it’s not so much because it’s a lack of diversity in the community or the community’s not meeting their needs, it tends to be for other professional reasons — additional training or, again, Keene’s wonderful but you have to find the right kind of individual, and as they tend to like the outdoors, they have a young family, want good schools, they tend to come and stay. Sansone: We try to do a really comprehensive orientation program. We try to do that education up-front and expose yourself, there’s more of a tendency to retain them. Kristiansen: I think people do come and leave for reasons other than just professional. Even if you’ve got different hair, trying to get your hair cut around here or buy cosmetics or whatever — the services aren’t there. The types of foods you want to buy at a grocery store everyday — we don’t have the critical mass when it comes to population. We’ve got a really high first step that we probably do need to make some gargantuan effort as a community to get to a certain point so that people will want to stay here and feel comfortable staying here. Henderson: I know a lot of the businesses that I work with that have it high on their priority list to try to recruit a more diverse employee population. I’m thinking of Corning in particular, which has a division here in town, and that’s a big part of their mission at the corporate level and I’d like to see that here in Keene. Q: Something that sets Keene apart is its manufacturing sector. There’s been a serious decline in the manufacturing sector, but it doesn’t seem to be happening in Keene. Lane: There’s a trained workforce that they can draw from, that’s really been the big advantage. Manufacturing is not what it used to be; it’s all more technology now than it is machining, but because we’ve had that center of machining, it’s really been a benefit to this community. Henderson: We have a terrific hands-on engineering program at the college. It’s called Sustainable Product Design and Innovation. We work very closely with a number of regional, statewide and out of-the-state companies in advanced manufacturing. We go to visit them, we bring them here, we establish relationships between faculty and their senior people and we listen to what their needs are and we try to bring that in to how we think about the process of education. In fact, we have co-designed improvements in the program with companies like Vic’s and are in the process of trying to roll that out now. I think that open, two-way exchange has the opportunity to benefit the company, it has an opportunity to benefit the students and it has the opportunity to benefit the programs that we have at the college. The Monadnock region alone has well over 80 manufacturers, and it’s all in secret. We have companies that are doing night vision for the military and stuff going on with telescopes, other companies making lenses that can detect HIV on a blood sample, so there’s a lot of that going on that we don’t advertise. 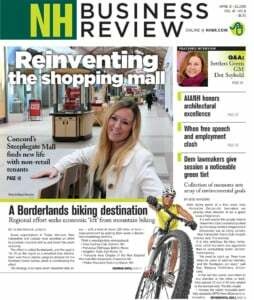 Kissell: The Monadnock region alone has well over 80 manufacturers, and it’s all in secret. We have companies that are doing night vision for the military and stuff going on with telescopes, other companies making lenses that can detect HIV on a blood sample, so there’s a lot of that going on that we don’t advertise. Some of the gap that I see is doing more advertising to the younger generation to let them know what’s available to them in this area and the technology that’s available to basically let them know what we’re doing for opportunities. Without that, they’re on the media, they’re scoping across country, they’re going to other cities and states to do that and we don’t do that. We have 65 employees, and there are a lot of companies around the area that are considered small even though they shouldn’t. We sold over $18 million of product last year. Like I said, we are one of the most profitable within our organization, globally. We’re giving our investors a good return on their investment, as well as our employees. If you look at all the vehicles in our parking lot, you can tell that they’re doing OK. They’re buying houses and they’re raising families, and they’re evolving. That’s a good thing. Lane: I talked to an industrial recruiter a couple of days ago. He said the biggest problem Keene has right now is that we have no empty buildings for industry growth. We have a lot of companies that are looking at Keene that are very interested in relocating here with zero empty buildings that the industry could move into right now. We have some limited sites where buildings could be built, but if somebody wants to move right now into an existing building, there isn’t anything. LaRose: In addition to manufacturing — I wish I brought my statistics with me on nonprofit and health and human services and the employment in these regions, but both hospitals are top employers in this region. Then you look at other health and human services — Monadnock Family Services, HCS (Home Healthcare Hospice & Community Services) SCS (Southwestern Community Services) and all of the myriad mid- to smaller-size organizations. It is a large part of our economy and it’s a large part of the workforce as well, and that’s what I think makes it a vibrant place to live and work, because we do have a lot of organizations here that work for the betterment of our community and a lot of people employed have been doing that as well. One more thing: I think health and human service organizations and nonprofits employ people at many different levels, similar to manufacturing, so there are a lot of wonderful opportunities for entry-level positions, where you can then move up and gain skills, of course there’s tons of support services that we’ve already talked about for gaining those skills, but you can also attract people at the higher level as well.